The new and old faces of Noah: what do they mean, and which is your favorite? 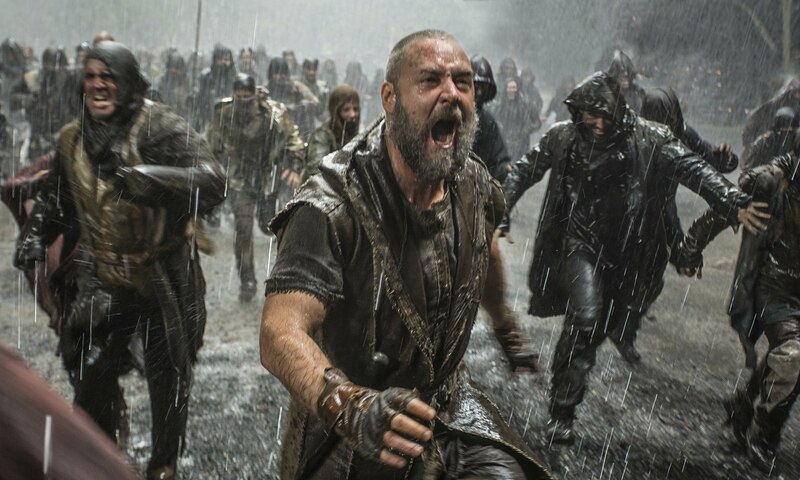 Darren Aronofsky’s new movie Noah is one of the biggest movies of this year so far, and is the latest in the line of films about the Old Testament hero. Each incarnation of the story has its own feel and personality, and puts forth the narrative through a unique social lens. For instance, Reverend Otis Moss III’s article entitled “A Biblical Review of Noah”, Moss states that Aronofosky’s Noah is “daring, powerful, and imaginative”, but also that it “expands the story” of the Bible. (Moss) Noah is more real than biblical, and the story of the Great Flood is a much more human. Our class has spent the last few weeks reading Edward Blum and Paul Harvey’s book The Color of Christ, which describes and evaluates different depictions of Jesus throughout American history, especially in terms of race. We also spent time looking at different representations of Jesus throughout the history of film. We watched bits and pieces of movies like “Passion of the Christ”, “Son of God”, “Godspell”, and “The Last Temptation of Christ”, and evaluated the meaning(s) behind their depictions of Christ. Dr. Altman then asked us a thought-provoking question: which Jesus was our favorite? As far as Noah is concerned, I would like to use a similar thought process to examine a character who has been re-invented through film almost as many times as Jesus. Here are a few cinematic representations of Noah. This is the “Wizard of Oz” meets “All Quiet on the Western Front” version of Noah. The film begins with the story of World War I, and the characters in the story are developed in the narrative of the days leading up to and during the war. When a comparison is made between the “flood” of blood in World War one and Noah, the frame of the film shifts, and the characters take on different identities (see Wizard of Oz reference) in the time of the Great Flood. I think that the anachronistic use of the biblical story is similarly used in Upton Sinclair’s They Call me Carpenter: A Tale of the Second Coming, which Blum cites in The Color of Christ. Sinclair’s “Carpenter” combines the story and ideology of Jesus with the racial tension of 1920’s Los Angeles. Similarly, “Noah’s Ark” synthesizes the violence and terror of World War I with the wrath of God in the story of Noah. George O’Brien’s more serious, stoic (and uncomfortably romantic) Noah embodies the drama of the silent movie era, and portrays the helplessness of both a soldier and a sheperd of the Great Flood. 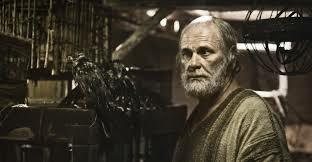 George O’brien’s scantily dressed and stressed out Noah. 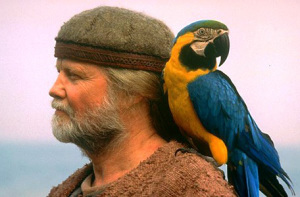 Jon Voight’s extremely loyal and frequently confused Noah. Complete with Macaw. Two things: I know that his name in the movie isn’t Noah, and the movie itself was awful. 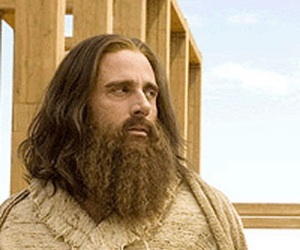 However, this modern depiction of the Noah story, regardless of how ridiculous it was, Steve Carell builds an ark, and his commitment to God demonstrates a choice between the sacred and the profane. Similar to the Tony Danza Noah, (which regrettably isn’t featured and regrettably is also terrible) Steve Carell’s Evan Baxter/Noah is a man called out of his suburban life by God to build an ark for an impending flood. Here is a situation where the protagonists are called to abandon their earthly lives to protect their people from an impending disaster. These stories provide a modern setting for Noah and the perceived distinction between the Durkheimian profane (earthly lives, success) with the sacred (misssion from God, earth-swallowing flood). Also, the director’s name sounds like it came out of the book of Judges. Steve Carell as Congressman Evan Baxter. Having a beard makes you Noah, right? I only included this Noah because he sounds like he belongs in How to Train your Dragon. William Wallace Noah isn’t on the screen for very long, but he does tell the entire story of Genesis in about three minutes. That seems like a good way to start a show about the Bible. He is white and has a beard, though. I still can’t figure that out. Scottish Noah has a beard too. And he really enjoys eating haggis. And playing the bagpipes. I think this Noah is the way that America would like to see themselves in that situation. Noah is driven by his devotion to his family, and his devotion in building the ark is a reflection of his paternal instinct. He builds an ark, and he looks like an ark-builder. He is human, and he is shown in the movie as being exactly that. Russell Crowe’s Noah. A burly, bulky, ark-building, bearded badass. He’s the team captain. Even if you didn’t want to, you now have an in-depth knowledge of cinematic Noahs and what they represent. I’ll ask the same question that was asked to us: which Noah is your favorite, and why? Which one is the most accurate, and which one speaks to you? Hollywood is Hell on Earth. This is what some Christians, at least in the South, would have you believe. Many of these people view Hollywood as a place filled with celebrities whose views have long strayed from those of mainstream Americans. A place used as a scapegoat for the “downfall of America.” A place where Christianity is almost nonexistent. A place not to be looked up to in any way. Oh yeah, and that place where all your favorite movies originate. I mean, it’s not like Hollywood has a track record of embellishing the narrative of a “based on true events” movie. Dr. Jerry Johnson, President of the NRB, summarizes the Christian viewpoint in his article about Noah as, “If the world made it, we are against it, and can provide the list to tell you why.” Instead of continually trying to pick a fight with Hollywood, Christians ought to embrace the fact that the film industry is spending millions of dollars to essentially tell the story of the Jesus and the Bible. In a similar article, Phil Cooke makes the case for why Christians should support the movie Noah, and other comparable movies. For starters, the story of Noah written in the Bible is fairly short. As with many parts of the Bible, this story leaves many blanks unfilled and leaves the imagination with room to wander. This means that in order to create a feature film, some creative freedom must be left to the writers and producers. This does not discount the entire story as worthless, though. Instead, this introduces a new viewpoint, perhaps never considered by the person watching. Furthermore, I know it may be hard for some to fathom, but there are a seemingly infinite number of interpretations of the Bible. This could be embraced as a way to promote an open dialogue about Christ and the many forms that He takes in different cultures. These movies are not intended to replace the Bible. Instead of complaining about trivial details, Christians should look to use these movies as a facilitator for nonbelievers. The art of filmmaking has the power to reach an audience untouched by the Christian community. These movies could lead to someone picking up a Bible for the first time in their lives. And, in the end, is that not what all Christians want?